Two horses in San Diego County have been placed under quarantine at their home farm after one of them was confirmed positive for equine herpesvirus -1 by the California Animal Health and Food Safety Laboratory. 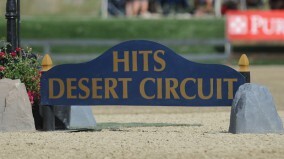 The horse, a 10-year-old warmblood gelding, had been stabled in Tent 21 at the HITS Coachella Desert Circuit in Thermal, Calif., from Jan. 21-Feb. 5. He presented with neurologic signs of urine dribbling and hind limb ataxia on Feb. 7. These symptoms plus the laboratory test meet the definition for equine herpesvirus myeloencephalopathy. To enter the showgrounds, HITS requires horse owners to produce a signed statement from a veterinarian proving the horse has been vaccinated for EHV-1 and EHV-4 within 180 days of the show.